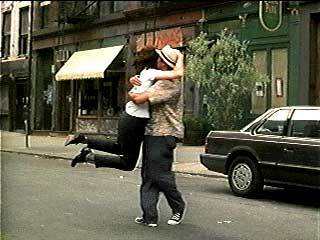 Andy Garcia wears black high top Converse “Chuck Taylor” All Stars in the film. Andy Garcia and Andie MacDowell have an off-again on-again romance in Just the Ticket. Just the Ticket is a romantic comedy about Gary Starke (Andy Garcia), who lives off of the streets of New York scalping tickets to unsuspecting tourists and Linda Palinski (Andie MacDowell), an electronics store manager who wants to study cooking at Cordon Bleu and become a chef. Gary and Linda at one time were very serious about each other, but Linda’s plans require a more stable existence than Gary can provide. Gary, the current “king” of the scalpers, would rather hang out in the streets with his buddies, living from day to day on what can be hustled in ticket sales, while Linda needs someone who can support her while she transforms her part time catering business into a full time career. As the film opens, Linda has dumped Gary for a new boyfriend Alex (Chris Lemmon), who is bland but stable, and we see Gary trying to figure out how to win her back. Every time he is able to connect with her, a little of their romance is re-kindled, but she is able to resist his advances because of the many times he has let her down before. Then, fate intervenes in the form of a papal visit to New York, where the pope will say a mass at Yankee Stadium. Gary figures that if he can scalp enough tickets to the ceremony, which will sell from $500 to $1000 apiece, he can retire, win back Linda, and provide her with the commitment she needs. Yet at the same time, she can’t find out about what he is doing, because she is adamantly opposed to him scalping tickets for a living. Although they have broken up, Linda still feels some attachment for Gary and his dog. Besides the romance between Gary and Linda, we are introduced to some of the other street characters that are important to Gary’s existence. Gary’s friend and gopher, Benny (Richard Bradford), is an ex prizefighter, who helps Gary with his ticket sales scams and thinks of him like a son but worries about the illegal means by which Gary intends to obtain the tickets. San Diego Vinny (Patrick Breen) is another scalper in the group who hang around and work with Gary their de facto leader. Cyclops (Laura Harris) is a nearsighted, self conscious young girl who has been fighting drug addiction, and then discovers that she is pregnant. And finally we are introduced to the villain of the piece, Casino (Andre Blake), a small time organized crime figure who wants to take over and control the ticket scalping that goes on in Gary’s neighborhood. This Damon Runyon-like cast of characters are only sketchily developed, and could have added more interest to the film, had their roles been given more substance. 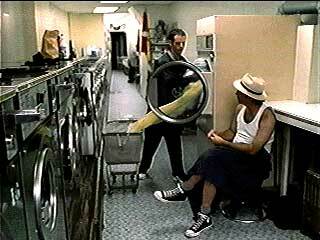 Vinny and Gary talk shop at the local laundromat. Just the Ticket has the potential to be an interesting film, but usually settles for the easy and predictable solutions to problems of characterization and story line. Andy Garcia brings a lot of energy and personality to the lead role, but his character (and those of his street companions who are portrayed as honorable scam artists) seem to belong to an earlier era than the nineties and lacking in modern street smarts or methods. If there was a plausible reason for his existence as a ticket scalper, it might have made his character more interesting and attractive to the audience. Andie MacDowell is too reserved in a role that doesn’t let her open up very much to the audience. The one thing this romantic comedy needs is an actual romantic scene between the two of them, where they both can interact and develop a rapport among themselves and with the audience. If Linda’s new boy friend had been given some personality and interest in life, the triangle between them could have been another interesting plot element. Likewise, more comedy would help keep things light, if that was the intent of writer/director Richard Wenk. One of the few scenes that does get us involved is when Linda has been hired to cater a dinner party by an influential food critic (Irene Worth), and Gary comes along to prove his sincerity by helping her. When the critic stiffs her for the amount agreed upon, Linda and Gary trash the kitchen with a high-spirited energy and rapport that would have been great to see in other scenes. Because the matron has been sneaking large gulps from the Scotch bottle away from her guests and in the process become quite tipsy, she doesn’t even notice as Linda and Gary roll the roast in kitty litter, toss eggs all over the kitchen, and spike the Scotch bottle with Tabasco sauce. Richard Branford and Andre Blake give us a few good dramatic moments occasionally, but too often you are reminded of Rocky or On the Waterfront or some other classic film that presented that kind of scene first. 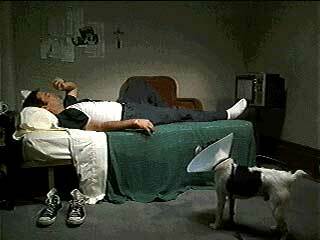 An exhausted Gary relaxes in his Spartan room. Gary tries to charm Linda into going out with him again. 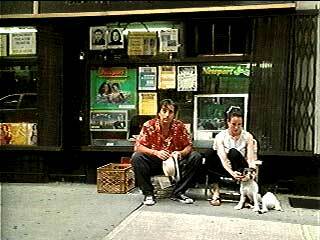 Andy Garcia gives us an urban street look with his black chuck high tops which he wears throughout most of the film. Two of the best scenes are when Gary is trying to get Linda to go on a date with him again, and you see him lying on her desk with his foot in the air, and when he is practicing his golf swing on the roof top of a building. Gary practices his golf swing while Cyclops looks on. Just the Ticket. (1998) Andy Garcia, Andie MacDowell, Richard Bradford, Elizabeth Ashley, Laura Harris. Directed by Richard Wenk. Categories: Drama, Romance.